Does adventurous mobile game make you go frenzy? In childhood, dashing quickly and dodging the police in police-thief chase game has excited you! And now, the fun of outrun and outmaneuver the police makes the game play more addictive! If it holds true, then Bank run, an endless running game would be the one that would become your favorite game play. Thrilling 3D game let the player act as a thief and player has to escape the police nipping at their heels in order to achieve an epic win. Such steep-winding game delights the gamers to the core and provides an exceptional experience. Fun-filled chase game has much more to offer! Bank Run– Let’s take a peek inside! 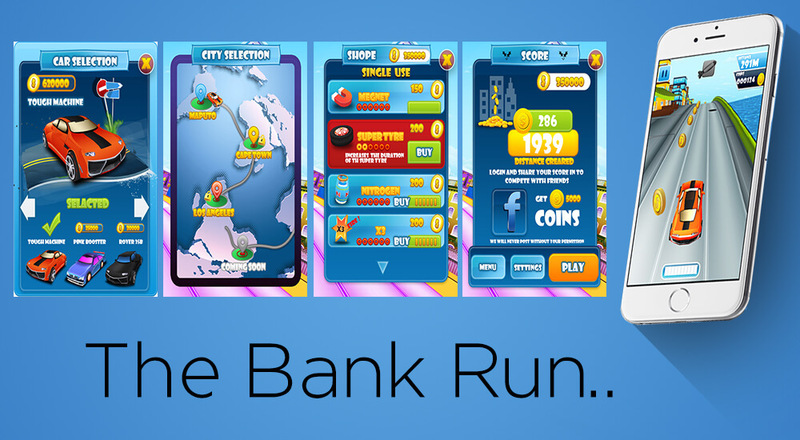 Bank Run is a 3D running game where player loots any of the banks in the chosen city and flee away in a car with money. When thief drives to dodge police, deadly barriers come in the way. The car is equipped with power-ups like- Power boosters, Megnets, Super Tires, Nitrogen Cylinder, Score Boaster X3 and keys to save the player from obstacles. The player amasses the coins scattered on the road to buy different exotic car models and increase the time limit of power-ups. The majestic game becomes more interesting with a lot of dynamic traffic and obstacles on the way. And, after achieving a certain score, a new city will automatically get unlock. The endless game will not end unless the player is caught by the police. The integration of Facebook API allows the player to play with Facebook friends and post their score as well. The unprecedented game is available for free on App Store for iPhone that fits the bill. Why are we second to none? Here, at Credencys, we take pride in delivering world-class apps across various platforms by deploying latest tools and technologies like Unity 3D. Our highly proficient programmers walk in the footstep of recent trend and build best ever app with a great synergy between client’s requirement and final solution. A number of running games like Subway Surfers, Bunny runs, Rail Rush is buzzing around the app stores. Instead, the gripping game is the one that has adventure, twists, and dynamism that keeps player’s brain alerts throughout the play. Bank Run is a game that will keep the players coming back and unable to pull away for too long time. It is an audacious police pursuit car game where the player will rob the bank and run away in a car. The car is equipped with ammunitions that protect the player from the police and enable to cross them distinct roadblocks coming in the way. Player has to collect coins scattered on the road and should not be caught by the police to win the game. The gaming apps designed with beautiful graphics, intuitive UI, animation and best sound effects are outstanding. Bank Run is an exemplary result of such engineering process that Credencys follows. Bank Run guarantees immense pleasure and thrill to the players, so get ready to join the most daring endless chase of the world!